1、Function: Confetti balloons can meet your needs for party wedding decorations. You can also use them proposal to your lover. 2、Size: Uninflated balloon is 13 cm long and 6.5 cm wide, the inflatable diameter is approx. 30.5 cm/ 12 inches, confetti is 2.5 cm in diameter. 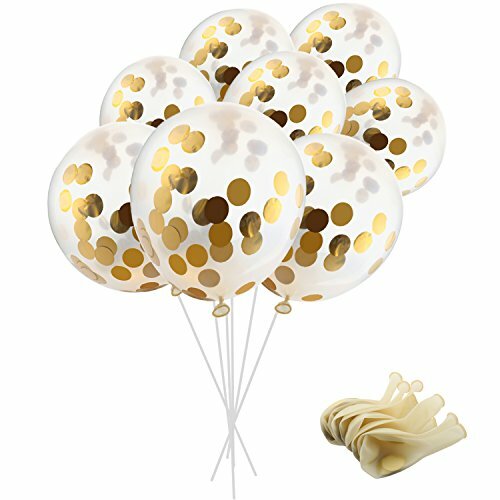 3、Quantity: 15 pieces confetti balloons can meet your quantities need. 4、Wide applications: This set of confetti balloons can be applied in many different situations, such as festival party,anniversary party, birthday party and so on. 5、Important: Due to the gold confetti is heavier than helium, the gold confetti moves in the direction of gravity. So before you inflate the balloon, spray a little water into the balloon or blow a little water through your mouth that the moisture will help the gold confetti stick to the balloon. Beyond that, rubbing the outer side of the balloon with a dry towel will also help the gold confetti stick to the balloon.